Moody's Investors Service said that the fiscal package passed by both houses of Congress yesterday is a further step in clarifying the medium-term deficit and debt trajectory of the federal government. It does not, however, provide a basis for a meaningful improvement in the government's debt ratios over the medium term. The rating agency expects that further fiscal measures are likely to be taken in coming months that would result in lower future budget deficits, which are necessary if the negative outlook on the government's bond rating is to be returned to stable. On the other hand, lack of further deficit reduction measures could affect the rating negatively. Notably, yesterday's package does not address the federal government's statutory debt limit, which was reached on December 31. The need to raise the debt limit may affect the outcome of future budget negotiations. Moody’s warned last year there would be a downgrade in 2013 if the debt to GDP ratio was not put on a downward trajectory. That would mean GDP has to grow at a faster rate than the debt. 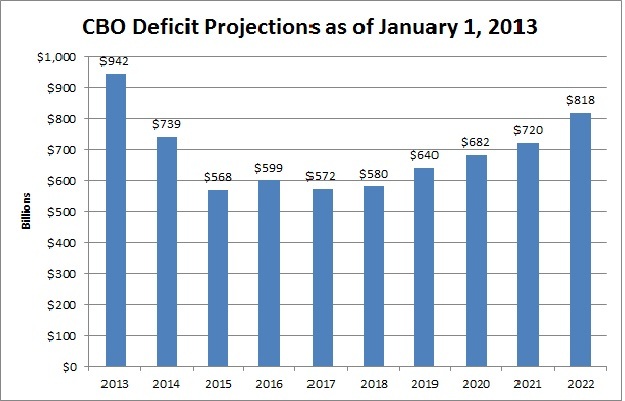 The chart below shows that deficits according to the CBO will range from $568 billion to $942 billion over the next 10 years. Notice the deficits climb in the last 5 years of this window, reaching $818 billion in 2022. Note that CBO has not budgeted here many of the big ticket items that tend to show up, such as Hurricane Sandy at about $60 billion in 2013, or the perennial “doc fix” at about $30 billion. Essentially, a realistic view points to deficits closer to $1 trillion every year for the next decade. Then there is economic growth. The CBO assumes GDP grows more than 6 percent in 2015 and 2016, outstripping the growth in the debt. That would be nice, but our analysis and many others indicate that may be optimistic. We find the fiscal cliff deal reduces GDP about 1.45 percent, once all of the changes take effect, with a commensurate reduction in private business stocks, wages, and hours worked. This lost GDP means lower actual, or dynamic, revenue than is projected by CBO. We find 64 percent of the projected static revenue will not materialize, due to these factors. This does not count income shifting, such as fewer capital gains realizations, which is likely to further reduce revenues. Bottom line, Moody’s will very likely downgrade U.S. debt if the present course continues. The debt ceiling negotiations, occurring over the next couple months, could avoid that scenario through some combination of large spending cuts and alternative revenues that are less damaging to the economy.